1. Anna V. Ivanina, Ballav Borah, et al. 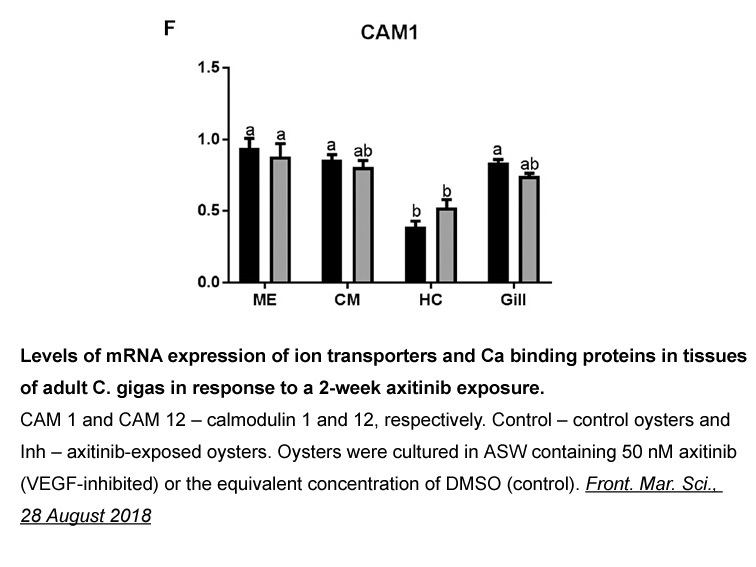 "The Role of the Vascular Endothelial Growth Factor (VEGF) Signaling in Biomineralization of the Oyster Crassostrea gigas." Front. Mar. Sci., 28 August 2018. Description Axitinib is a multi-target inhibitor of VEGFR1, VEGFR2, VEGFR3, PDGFRβ and c-Kit with IC50 values of 0.1 nM, 0.2 nM, 0.1-0.3 nM, 1.6 nM and 1.7 nM, respectively. The solubility of this compound in DMSO is >10 mM. General tips for obtaining a higher concentration: Please warm the tube at 37 ℃ for 10 minutes and/or shake it in the ultrasonic bath for a while. Stock solution can be stored below -20℃ for several months. In transfected or endogenous RTK-expressing cells, axitinib potently blocked growth factor-stimulated phosphorylation of VEGFR-2 and VEGFR-3 with average IC50 values of 0.2 and 0.1 to 0.3 nmol/L, respectively. Axitinib inhibited VEGF-stimulated survival of HUVEC with IC50 value of 0.17 nmol/L. Axitinib dose-dependently inhibits tumor growth in MV522 with ED50 value of 8.8 mg/kg twice daily, based on the relationship between dose and the corresponding TGI (tumor growth inhibition).
. Hu-Lowe D D, Zou H Y, Grazzini M L, et al.Nonclinical antiangiogenesis and antitumor activities of axitinib (AG-013736), an oral, potent, and selective inhibitor of vascular endothelial growth factor receptor tyrosine kinases 1, 2, 3. Clinical Cancer Research, 2008, 14(22): 7272-7283. 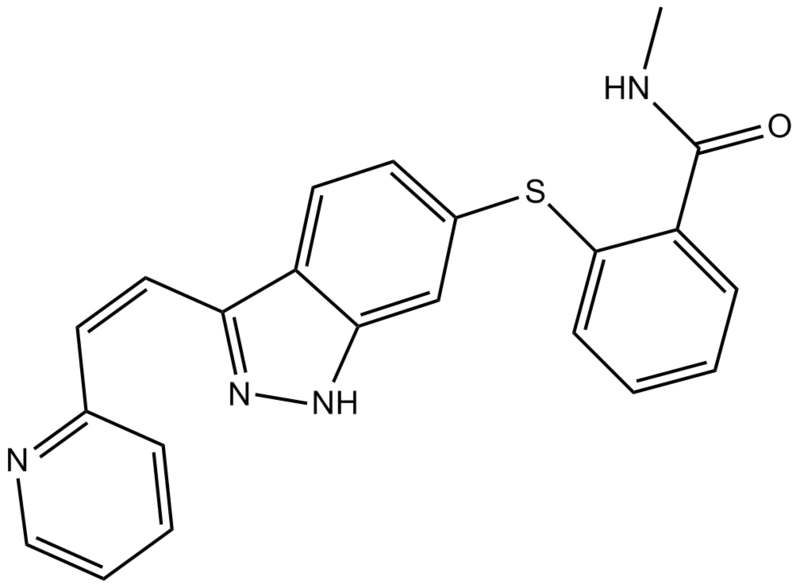 Axitinib is a selective and oral inhibitor of vascular endothelial growth factor (VEGF) receptor tyrosine kinases 1, 2 and 3 with . Axitinib inhibited the phosphorylation of VEGFR-1, 2 and 3 with IC50 values of 1.2 nM, 0.2 nM and 0.1 to 0.3 nM in cells, respectively. In HUVEC cells, Axitinib inhibited VEGFR-2 stimulated cell survival with about 1000-fold selectivity against FGFR-1. Axitinib also significantly suppressed the phosphorylation of VEGF downstream signaling molecules including Akt, eNOS and ERK1/2. Besides that, axitinib inhibited VEGFR-2 phosphorylation with EC50 value of 0.49 nM in vivo. It delayed tumore growth of human xenograft tumors in mice such as M24met, HCT-116 and SN12C . Hu-Lowe D D, Zou H Y, Grazzini M L, et al. Nonclinical antiangiogenesis and antitumor activities of axitinib (AG-013736), an oral, potent, and selective inhibitor of vascular endothelial growth factor receptor tyrosine kinases 1, 2, 3. Clinical Cancer Research, 2008, 14(22): 7272-7283.